Markets continued their climb in Q3 2017 with stocks and bonds both domestically and internationally providing positive returns. 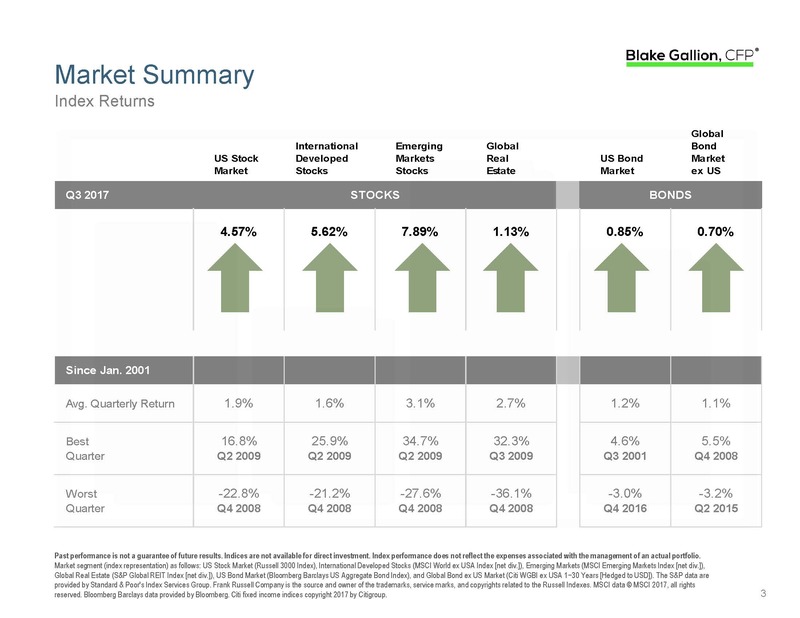 International and emerging market stocks also continued to outperform the US as they did in Q1 and Q2, and US bonds slightly outperformed the global bond market. Planning note: I’ve talked to many people that have not participated in the market rally that has lasted for years now. The main reason is that our emotions are strong and we fear investing at the wrong time (i.e. market highs, of which the Dow Jones Industrial Average has had 45 this year alone and 168 since the 2008-2009 recession). I understand this and battle the same emotion myself, yet, I am fortunate enough to continuously be reminded through my ongoing research and education that developing a plan, building an investment strategy to support that plan, and continuing to stay disciplined is the best course of action to accomplishing financial objectives. This gives me the confidence to stick to the plan. If you feel like I’m speaking to you, maybe I am 😊 but you’re one of many. Just as a personal trainer will help you get the most out of your workout, if you’d like help getting the most out of your financial resources I’d love to help develop a strategy that is right for you. Email me at advisor@blakegallion.com to set up an appointment.